There is surprisingly little literature on strengths-based approaches to group work. Most of the available literature focuses on groups as part of a broader strengths-based approach to a particularly issue or target group, rather than a strengths-based approach to actually working with groups. The following are seven principles that underpin my strengths-based approach to group work. Focus on strengths, abilities & potential rather than problems, deficits & pathologies. This nearly goes without saying: it is the basis of strengths-based approaches. 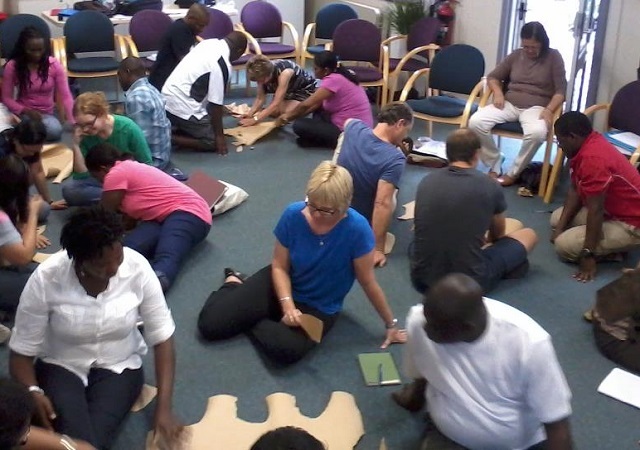 Recognise the strengths and expertise of participants: Everyone is a teacher and a learner. In strengths-based groups, everyone has something to contribute and everyone can learn. Rather than being the expert, facilitators recognise the expertise of participants and are open to learning as well. Actively involve participants in decisions about the purpose, content and processes of the group. Strengths-based groups are unlikely to run to a set curriculum with a pre-determined outcomes. Because we recognise the strengths and expertise of participants, the group often plays an important role in shaping what happens. Focus on the whole person and recognise their social context. Rather than focusing on the “broken” part of participants, strengths-based groups focus on the whole person. In workshops with Aboriginal fathers in prison, the fathers responded very positively to the workshops because we didn’t focus on the behaviour the contributed to them being in prison but rather their role as fathers. As part of this focus we did discuss issues like violence, drugs and crime, but it was in terms of their roles as fathers. It made a huge difference to how they approached the discussion. Use language that is strengths-based, non-judgemental, inclusive and future oriented. Clearly our language has to be consistent with a strengths-based approach. In particular when asking questions, we need to ask strengths-based questions that focus on the future rather than focus on the problem. Encourage experiences where group members can be successful. Working in groups can provide people with a range of opportunities to be successful. By creating safe, supportive environments, participants can try new skills, activities or behaviours without being ridiculed. Opportunities can include acknowledging insights and experience within the group, encouraging participants to take on new roles in the group (even something like scribing for a brainstorm), or creating more complex hands-on activities. Recognise complexity and have a commitment to social justice. Many families face a range of complex problems that cannot be simply addressed by focusing on people’s strengths. A major criticism of strengths-based practice is that it is closely aligned with neoliberal notions of individual responsibility and self-help and that it ignores structural inequalities. We need to recognise that strengths-based practice is not the answer to everything and we need to address the broader issues that impact on communities, families and individuals. What principles do you think underpin a strengths-based approach to working with groups? Malekoff, A. (2014). Group Work with Adolescents: Principles and Practice (3rd ed.). New York: Guilford Publications. This entry was posted in Facilitation & teaching, Strengths-based approaches & ABCD and tagged for, For students, Group processes, Group work, Strengths-based approach, Strengths-based practice, Working with groups. Bookmark the permalink. Many principles of ABCD overlap strength-based approaches. I wonder if there is any significant difference? ABCD is a strengths-based approach to working with communities, so there are many overlaps between ABCD and other strengths-based approaches. Working with groups (e.g., facilitating workshops or support groups) involve different skills and strategies to working with communities so there are differences between these principles for working with groups and ABCD, but there are also similarities.